Video of Illuminating the Face on Location. With Peter Hurley. When it comes to all things headshots and manipulating human expression, the best guy to seek council from is Peter Hurley. Peter's career has spanned about 15 years now, and over those years he has gained a tremendous amount of knowledge. Last year with the help from our friends at Profoto, Lee and I were able to film a supplemental free chapter to Peter's Illuminating the Face Tutorial. In this video Peter takes us outside to show some of the techniques he uses out on location. Peter Hurley is primarily known for his signature headshot look which consists of a white or gray background, horizontal framing, super soft window lighting, and of course killer expressions from his subjects. He has varied this look over the last few years such as creating moody and contrasty looks for men as well different shaded backgrounds, but for the most part his headshot work has been a staple for his business. A big goal for any photographer is to create a style of photography that can instantly be recognized without having their name attached to the image, and Peter Hurley's success can be attributed in large because of his branding and quality of work. What you may not know is Peter shoots a lot of environmental portraits for businessmen, actors, celebrities, and politicians (check them out here). As with any good environmental portrait, having complete of control over your lighting is crucial when working out on location and away from the studio. In the studio Peter mainly uses his tried and true Kino Flo light banks. This gives him the ability to shoot images with a shallow depth of field while also not having a distracting flash popping directly into his subject's eyes. Constant lights are great for headshots because they also cause people's pupils to dilate which adds a ton of color in their eyes. However as many of you know, it can be very difficult over-powering the ambient light with constant lights when out on location and in bright situations. This is where the use of powerful studio flash comes into play. In this video, Peter shoots two well known actors in two completely different environments. First Peter heads into the woods to capture a whimsical portrait of teen actress Elena Kampouris and her dog. With Elena the goal is to produce both a outdoor headshot as well as something more editorial in nature (check out the studio shots he did for Elena's IMBd page here). 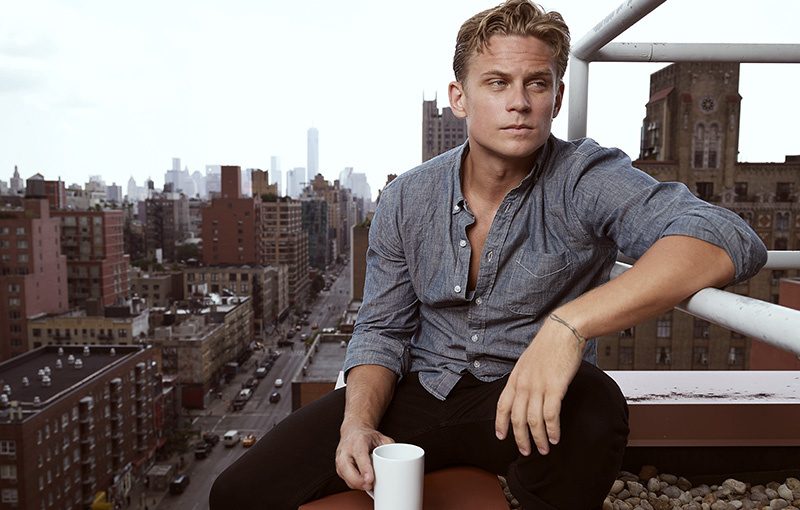 Next Peter takes his gear up to the a NYC roof to capture the hot new actor Billy Magnussen against the Manhattan skyline. With the sun as his key light, Peter uses his strobes not to over power the sun but to supplement the harsh and edgy natural light. 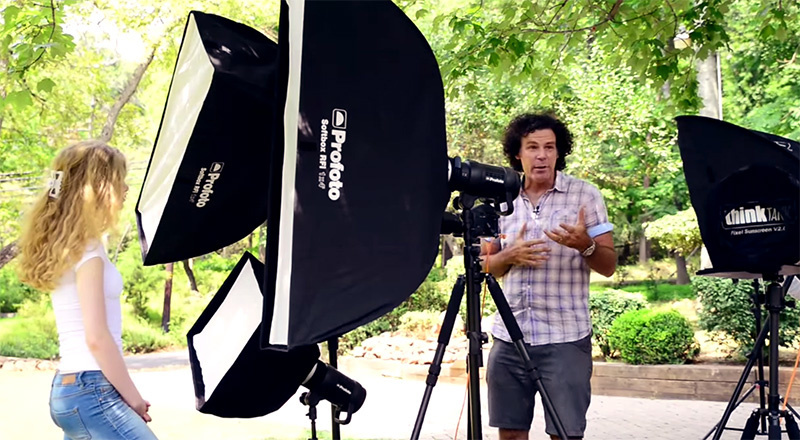 In the video above, Peter uses up to four Profoto B1 portable flash heads to craft his lighting on location. Peter has been singing the praises of his Profoto lights for a few years now; he absolutely swears by their Acute and D1 systems. After watching a few of my favorite photographers use Profoto gear, I decided to make the switch over to Profoto myself. I can honestly say these lights are the best lights I have ever used so far. Without bashing any other brands, what I love about the B1 lights (and I'm sure Peter can agree) is that the battery is built directly into the units so you do not have to have any extra battery packs to carry, there are no cords to trip over, and everything can be controlled directly from the Air remote on top of your camera. During the filming of this video, Peter's assistants were especially happy to not have to hoist his lights up and down every time he needed to change the power of the flash. If you've read my rant about radio triggers you know that I've also found the Air Remote to be the most consistent and reliable radio trigger on the market. Maybe I'm just lucky that way but so far so good....fingers crossed. There are a lot of other flash makers that can boast these same features, but what I find perhaps the most exciting thing about these B1 flashes is they use the best speedring ever designed. I never thought something as boring as a speed ring would ever make me value one product over another but in my opinion this single feature has made my life so much easier. No more little clamps to perfectly line up, no more embarrassing moments where a 7' octabox crashes to the ground, no more broken flash bulbs (you know this has happened to you too), and no more speedlight brackets breaking. When we filmed Illuminating the Face in the studio, Lee and I acted as Peter's personal assistants, and the Profoto speedring made it a breeze changing between every light modifier Peter used. So no matter if it was a beauty dish, small softbox, stripbox, 7' octabank, or mola dish, the tension clamp design was a nice addition from other speed rings I had used. Profoto gear is built tough, but it does have one caveat: these strobes will hit your wallet hard. Yep, the Profoto B1s are the most expensive portable lighting solution I've ever used. However, like most things that have a high price tag, I can honestly say the little features are worth the extra money. These features may not be as appreciated by the part time photographer but once you start shooting at the level of someone like Peter it quickly becomes worth paying a little extra to avoid all the little hassles that come with less expensive strobes. Every single time I get to see Peter work, I find myself picking up some little tip that might not be so obvious. Sure, it's easy to say that Peter has all this expensive lighting gear and a camera most of us will never be able to afford, but the brilliance in his photos can be found in the much smaller things. They say the devil is in the details, and when it comes to great portraits this common saying is absolutely true. I can still remember how blown away I was watching Peter work as we filmed The Art Behind the Headshot. He could manipulate someone's face and make them look like a completely different person just by working their angles and making them feel comfortable in front of his camera. It was like watching a magician. What Peter taught me was that having great lighting is only half of the equation; the other half is making your subject matter look super interesting and exciting through your coaching and directing. Luckily with Illuminating the Face, Peter has shared both his technical and creative expertise so other aspiring photographers can get the most energy out of the people in front of their own cameras. Lee and I absolutely enjoyed challenging Peter by getting him out of the studio and out on location for this free tutorial outtake. I hope you can find a few useful tips from this video regardless of what camera or lighting gear you use for your own work. Cool video, I watched it earlier when profoto released it in May. So good watching Peter at work. I struggle with direction slightly especially when just the bride and groom at weddings... but this has given me some confidence in the fact that what I'm doing is on the right track, I just need to be more decisive. Thanks so much for posting this. Really? Shadowless front light is neither original nor a comprehensive approach to shooting humans. So much of the output I have seen from this photographers seems to have the goal of chasing away all shadows. Two strips and and up-light for an outdoor portrait? I have not seen the full video, so maybe there is more variety there. Blanched faces and shadowless light was popularized by Sarah Moon in the 80s and even she has moved on since. I am glad that you gained something from the techniques in the video, but I would suggest that there are many other photographers and instructional videos that offer a broader view of lighting. It really has to do with headshots and shooting females. It's pretty amazing what good flat lighting can do in terms of removing blemishes that are traditionally removed by a retoucher. There is a time and place for all sorts of lighting setups but for female headshots, soft front light is usually the best route to go for showcasing someone's personality. I wouldn't say Peter is "chasing away all shadows" as he regularly adds shadows and highlights to his headshots to add character, moody, and mystery. But generally his images replicate sort of a beauty light that does traditionally aim at creating a soft natural look that would be similar to placing someone in open shade. It's amazing what proper lighting can do for skin and bags under the eyes. Totally agree. I am not being sarcastic or anything here - could you guide to some of the videos you were referring to? Look for Joey L. and Joe McNally to start with. 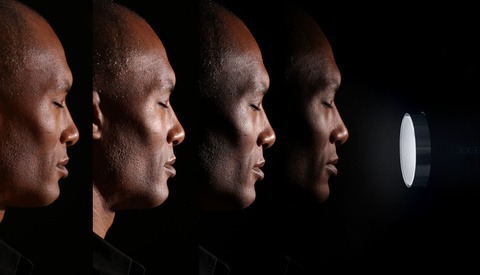 Both demonstrate lighting techniques that celebrate their subjects features, rather than erase them. Both photographers have been featured here on FStoppers. Again it just come down to the genre you are shooting for. Joe is a lighting master no doubt but most of his work is more editorial in nature meaning his subjects are placed in an environment and lit so they look cool, interesting, mysterious, etc. This usually doesn't work with headshots because, well, for one you can't show too much of a scene when your subject's head takes up most of the frame (check out Dylan Patrick's work for the best example of headshots with some element of environment). The other reason you can't add too much mood to a traditional headshot is because you want people to look like themselves at the end of the day. It's easy to light and photograph anyone and make them look badass, edged out, mysterious, and exciting but that's not the purpose of a headshot. I've looked for a lot of McNally headshots and they are pretty rare but here is a good example. This shot has a lot of mood and def accentuates the model's features but this would be completely unacceptable as a headshot. There is too much makeup, hair styling, mood, beauty lighting....it's amazing for a beauty style shot but not a headshot if that makes sense. Compare it to the second McNally image which also is too stylized to be used as a headshot but you can see how much more natural and inviting the lighting is....and it's pretty flat lighting like Peter and other headshot photographers do. Again there isn't a "right" and "wrong" way to light a person but it def has to fit the genre. If you are photographing a cowboy who wants a fun headshot showing off his toughness then yes you are going to side light him and make it moody. But for the main stream people needing business headshots for LinkedIN, Facebook, Business Cards, and website bios, you are going to want to go with the flatter light (especially for women). You write: "The other reason you can't add too much mood to a traditional headshot is because you want people to look like themselves at the end of the day." This is precisely the reason that I have a problem with Hurley's results. Kino's surrounding the face in a large ring configuration is NOT the way would suggest shooting a performer to 'look like themselves'. Even your examples illustrate how much less contour information (facial topography) in the flat front light. The criticism within the industry--not just from me--is that applying the same heavy-handed approach to every subjects creates a uniformity of results. It is hard for individual performers to stand out if they look like every other blonde or brunette, etc. Individual performers actually discuss this amongst themselves, not just fellow photographers. I did not site Joey L or Joe McNally for their headshot work. You yourself even reference his Hurley's environmental work which greatly pales in comparison with them. Those were just two examples I pulled quickly. The other respondent was seeking information on other photographers, but that is not really my job to point out. My position in this thread is that Hurley's approach, though successful for him, is not what I would recommend for people seeking to shoot life-like or natural portraits which are the essence of headshots. If you really wanted to examine the market for professional headshot photography in NYC and LA you would find an overwhelming majority of working shooters embrace (celebrate) a performers features--not suppress them.